This is the second day of my “5 Day Black and White Challenge”. Again, the rules are: (1) publish a black and white photo every day for 5 days (2) invite someone to participate each day. I would like to invite Tree from Conversations Around the Tree to participate the challenge. Tree is a person with a big soft heart. Everyone loves Tree! Today, I want to share a lotus flower photo, which I took last year at Kenilworth Park in Maryland. Their Lotus & Water Lily Cultural Festival is excellent. Good morning and thank you, Ruth. Your lotus is simply gorgeous Helen. WOW!!! Thanks, Cee. Good morning. I like lotus flower a lot. The festival was amazing. Hopefully, we will be able to go again this year. Have a great day, Cee. This is one of the best photos EVER! I can see the flower dancing! You truly are an artist. Helen, I was going to come over this week, but have to go to Albert Lea on Saturday for a funeral, and I didn’t want to drive that way twice in a week. And next week I am going to Florida to get away from this cold weather so it will be a couple weeks yet before I get over your way. Thanks, Sue. You know there is post processing applied, right? When I first started I was amazed at many photos I saw. I thought they were taken that way. In this photo, I increased the contrast and also sharpened it. I hope it’s not this cold on Saturday. I have stayed home for a few days now 😉 Florida sure sounds good. Have a wonderful trip. Take some photos! 😉 I will see you in Mar. sometime, I hope. Just beautiful in black and white! 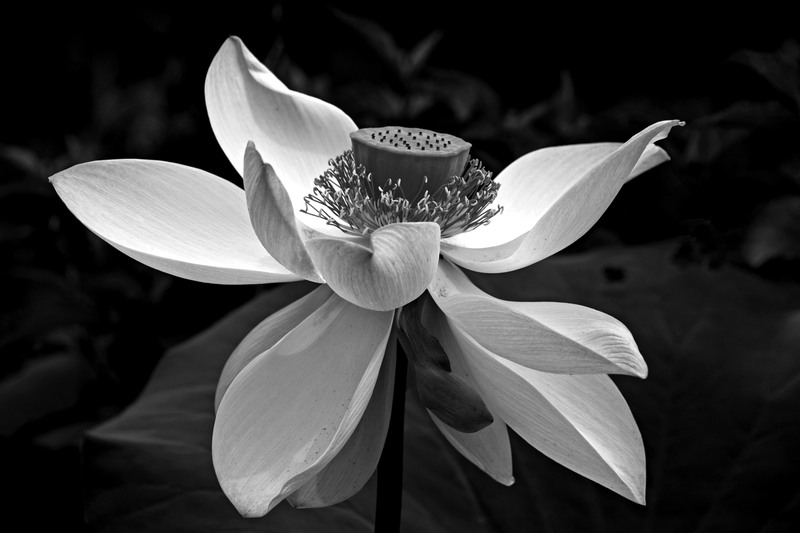 The lotus flower showcases beautifully in black and white. Well done … !!!! Thank you. Congratulation for completing the challenge!!! I still have 3 days to go 😉 It is fun, I have to admit. I didn’t realize how much I liked black and white photos! So pretty, Helen. The center of the flower is very interesting. Great shot and I am so happy you are having fun with this! Me, too– B&W is pretty cool. Good morning, Lois. Thank you for your kind comment. Yes, I am having a lot of fun… more than I have expected. I even feel like to go out to take more in this cold weather! And thank you! That is really cool! LOVE IT. Thank you, Sue. We have a nice sunny day today. Sunshine and kind comment like yours makes a great day! Helen, Thank you for the invitation! I am excited to be part of this challenge. My day has gotten away from me…so I will post day one tomorrow. Your photo of the lotus flower is simply beautiful! I agree with Amy…you are raising the bar! Good morning, Tree. I can’t wait to see your photos!!! It’s fun to do a challenge with friends! That is a lovely lotus flower you have captured. The light tones of the pedals are rich and so detailed. Good morning, Otto. Thank you! Teacher’s comment always means a lot! I am still thinking about passion, purpose. Your articles really helps me figure out things in my life… I just need to organize my thoughts. Thanks again. Molto bella questa foto, complimenti!! 2004. Your laboratory imported it from New Zealand and has taken. Thanks, Suyash. I have to say that I like B&W much better. I do like the original one with color, but B&W seems really brought out the line and form. Absolutely fantastic picture. really nice. Thank you, Ben. If you wonder how come I haven’t comment much on Lightroom tutorial, it is because I want to do all of them in the same week… probably the week after next… Thank you so much! That would probably be a good time to do a cram session as I am coming to the end of the editing side of lightroom and moving on to photoshop.